With a well balanced audio boasting a clear midrange and extended highs, the Acton gives an experience that is both articulate and pronounced. Its powerful deep bass seems to defy the laws of nature for it is small size. It is these hifi qualities packed into a classically designed and compact frame that set the Acton apart, positioned to take on even the largest of competitors. Acton’s custom control 3 analogue interaction knobs allows you to fine tune it to the exact sound you desire. A nimble and versatile workhorse, it joins the Marshall family with vengeance, carrying on a long standing tradition of loud. When it come to looks, the Acton has inherited all the family traits, boasting the classical and durable vintage design, and iconic script logo that is so distinctly Marshall. 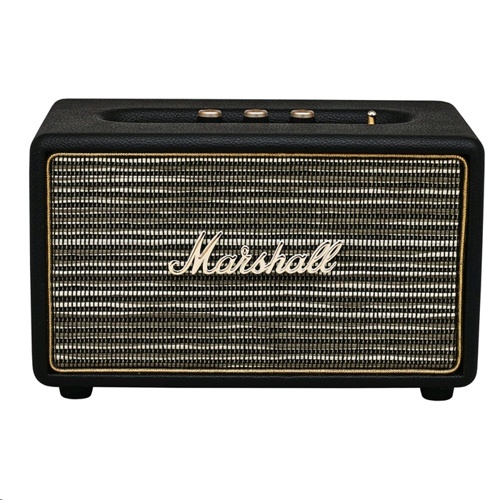 The Acton is right at home with the rest of your Marshall collection. BLUETOOTH CONNECTIVITY Use your Bluetooth®-enabled smartphone, tablet or computer to stream music directly to your Acton with no wires attached.